Talk about your teachable moment. BP's Deepwater Horizon blowout in the Gulf of Mexico provides a unique opportunity to build and fight in the popular consciousness for a wide critique of the capitalist system and its workings. I say unique because tens of thousands of barrels of crude oil are still pouring into the Gulf of Mexico every day despite all the public relations soft soap and magic bullet solutions--the Top Hat, the Junk Shot and the rest. It's 40 days on and there's no end in sight. The disaster has people in this country and around the world transfixed. The longer it goes on, the more questions arise, and the more BP's crimes seep not only into the Gulf but into popular culture. So far the media haven't been able to produce a bright, shiny scandal distracting enough to refocus many people. Eventually fatalism will take hold and even concerned people will no longer be able to stand thinking about it, but before it does, let's look at the opening we've been provided with. 1. It exposes the basic nature of capitalism. The iron law of capital is expand or die. BP became the fourth largest corporation in the world by ruthless mergers with smaller, weaker oil companies like ARCO and Amoco and global power politics like the MI5/CIA operation which in 1953 overthrew of the Mossedagh government in Iran which had nationalized the country's oil. 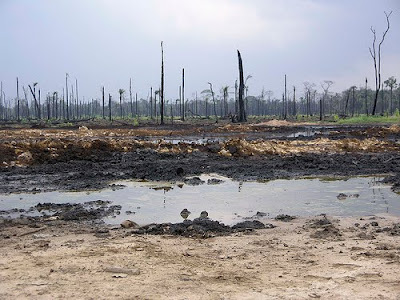 They have twice, in 2000 and 2005, been cited by Multinational Monitor magazine as one of the 10 worst corporations in the world on account of their environmental crimes and unsafe operating practices. (They should be a shoo-in for 2010). With pressure growing on BP and Big Oil in general to respond to climate change and peak oil, BP executives decided the most cost effective thing to invest in was--a public relations campaign. In 2000, they hired Oglivy & Mather, the Madison Avenue giant, who came up with the "Beyond Petroleum" campaign, including BP's heliocentric green and yellow logo. The $200 million cost of the campaign was worth it. Polls showed this greenwashing had the public seeing BP as the most pro-environment of the energy companies by mid-decade, even after its antiquated Texas City, Texas refinery blew up in 2005, killing 15 workers and injuring scores, and its corroded pipeline in Prudhoe Bay, Alaska ruptured in 2006, leaking a quarter of a million barrels onto vulnerable tundra. And BP continued to cut corners everywhere, ignoring standard procedures, safety warnings and danger signs on the Deep Horizon platform project, to squeeze out every last dime of profit--with results the planet will be living with for decades. And that expand or die thing? Ironically, the blowout has hammered their stock down so far that other big oil companies, Shell in particular, are strategizing about making takeover bids for BP once things have settled down a bit, and the extent of BP's liability becomes clearer. 2. It exposes the fact that corporations and the rich get to play by different rules from everyone else. Let's say I inherit a property in an unincorporated area and want to put up a house on it but learn I may be building on top of an old gas station. To save money I don't tell anybody and hire a couple teenagers to rent a jackhammer and see what they can find under the broken pavement there. The kids breach and blow up the old gasoline storage tank, killing themselves, burning down several neighboring homes and saturating the whole neighborhood with toxic fumes. A week later, would I be in charge of the cleanup? Nope, I'd be in the hoosegow, facing serious time. 3. It exposes who it is that the government actually serves in our "democracy." The Bush administration and the current one are both BP's accomplices, pure and simple. BP, of course, got a "categorical exclusion" last year from having to file an environmental impact statement for the Deepwater Horizon rig. The Interior Department kept issuing them well after the blowout. Not surprising, given that its Minerals Management Service, is a hotbed of industry-funded corruption. And that Interior Secretary Ken Salazar took on a former BP executive named Sylvia Vaca as deputy administrator for land and minerals management. A new Rolling Stone article reveals that the government was in the loop with BP on the blowout from Day 1. Laws to regulate dangerous business practices don't go away (or get waived) by themselves. In 2004, BP's political action committee made donations to candidates totalling 678 thousand bucks. In 2006, 601K. In 2008, that was 619 thou. In 2006, the last year I could find, BP spent $3,650,000 on lobbying. These figures include neither individual executive's campaign contributions nor lobbying by industry associations BP belongs to. To underline this lesson we have the ugly fact that the government has turned the job of ending the blowout and mitigating the disaster to BP itself! 4. It exposes the nonsense of neo-liberal market worship. Ask those "The less government, the better" types to explain how the invisible hand of the free market would have prevented this from happening had there been no government regulation at all. Oh, yeah, and how it would force BP, a giant multinational in a oligopolist industry, to fix things faster and better, and to more efficiently make the victims of the disaster and the environment good. Or are we just supposed to exercise our Second Amendment rights on Tony Hayward to caution other Big Oil execs that they'd best clean up their acts? 5. It exposes the right wing "populism" of the teabagging and libertarian types. 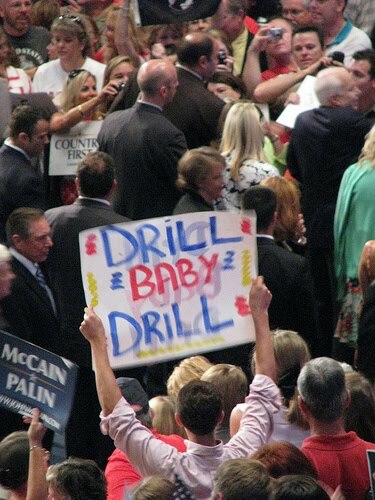 They are saddled with their "Drill, Baby, Drill" slogans which were a centerpiece of the Tea Parties. And they don't learn. Rand Paul, son of Ron Paul and Republican candidate for Senate in Tennessee, actually said last week that Obama (Obama!) "sounds really un-American in his criticism of business," when he took a couple belated shots at BP. Now Bobby Jindal, Republican Governor of Louisiana, is protesting the belated federal moratorium, a six month halt, on new deep water drilling while safety issues are examined. 6. It exposes other weak points for capitalism where they intersect with BP--and more crop up daily. Today the news broke that a local sheriff in Louisiana has called in "La Migra," a/k/a Immigration and Customs Enforcement or ICE, because he suspects that undocumented workers may among those taking on the dirty, unsafe and thankless job of cleaning up after BP and protecting the state's coastline. 7. It exposes the mainstream media as lapdogs of capital. For weeks they acted like stenographers for BP and US officials downplaying the disaster, and hyped each successive attempt at a "solution" even after it had failed (possibly because BP flacks didn't keep them informed). It was only the combination of the blogosphere and intrepid pilots and boat operators and scientists and oil industry veterans who forced the real facts and prospects into the public eye and finally got the media raising some timid questions (although the appalling kerfluffle about whether Obama was "acting angry enough" sucked up a lot of their attention). They are hardly even making any noise about the fact that BP turned access to its underwater video of the blowout on and off for weeks. Or that BP made boat owners they contracted with sign charter contracts forbidding them to talk to the media or disclose "Data" they might come across. Or that BP has local law enforcement keeping journalists away from beaches and cleanup areas. Or that anyone wishing to fly over a huge chunk of the Gulf of Mexico has been told by the United States Coast Guard that they have to get permission from BP's command center. Or that BP purchased the top slot at Google.com so searches for "oil spill" and similar queries would be directed to their site. 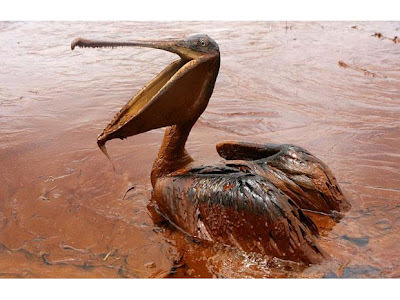 Tellingly, one thing BP has tried hardest to suppress is the shocking pictures of birds and other wildlife coated in deadly oil. These pictures clearly indicate to people how deadly the spill is (and will continue to be). They trigger intense feelings of compassion and horror, and they help people reflect on how even something as resilient as an ecosystem can be trashed by greed. 8. It exposes the racism, jingoism and great power chauvinism of Big Oil and the media. News story after news story frets about the "oil spill" getting into Gulf of Mexico currents and winding up in the Florida Keys or even being carried North along the East Coast. That refers, it goes without saying to the East Coast of the United States. You'd never guess that there are other countries bordering on the Gulf of Mexico, or that anything rounding Florida is going to wash up on Cuba and the Bahamas first. Commendably, one newspaper, the Guardian (from England, not the US) has carried a harrowing report telling how spills in Nigeria, offshore and on land, are at a level that still dwarfs the Deepwater Horizon blowout so far, and describing the horrific effects on the population and the environment there. It should be spread widely. 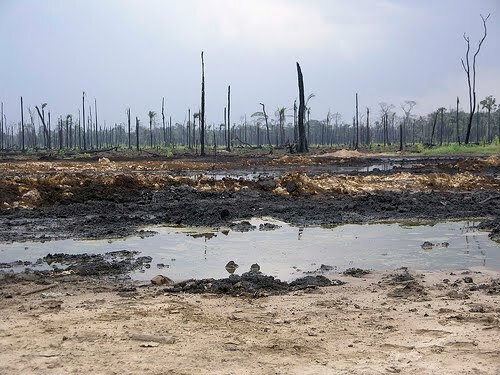 Environmental groups have done similar exposures about Latin America. 9. It exposes the capitalist mode of production and the capitalist as contrary to the interests of the world's people. Petrocapitalism some have dubbed it, because imperialism has been increasingly based on petroleum as a source of energy for its whole existence. Petroleum is the largest non-living input into commodity production, the basis for enhancing the productivity of human labor to levels unimagined a century ago. It is central to a global society organized around the incessant production and consumption of commodities--goods and services created for sale in the market, whether needed or not. As such, dependence on petroleum is a major feature of the world we live in. And the human race is using it up. Fast. There is more oil to be extracted, to be sure, but under conditions worse those feeding BP's underwater gusher, with consequent hazards to the environment and humanity. The logic is inescapable. A new world is not only possible but necessary, and it will have to be a world where society is organized to meet people's needs and in which people collectively and actively produce what they need and do it with an awareness of what their production and consumption is doing to the planet. Expand or die and the drive for profit have no place in this new world. Let's call it socialism for starters. A final and obvious point. I have written, nine times, "It exposes..." Well, the BP's Deepwater Horizon blowout ain't exactly gonna do that all by itself. It needs our help. I'm not going to prescribe here. I hope that others reading this will chip in ideas on how we should be helping friends, family, co-workers, strangers draw some of these conclusions. Because even if this is a teachable moment, we all know that lecturing at folks, especially ones who didn't sign up for it, is bad pedagogy. How should we be teaching? Teachabilty is always relative. Some folks are at a place where they are ready to move from being progressive to seeing capitalism as the problem, and your article would be very helpful to them. For those who are not there, one approach is to make anti-capitalist demands that make sense to the average person, so they can see the various forces embedded in capitalism close ranks against perfectly reasonable ideas. Turning BP into a publicly owned nonprofit whose purpose is to remedy what BP has done wrong in the Gulf would be one example. Relearn (learn) just how many perfidious acts BP has been caught out in so far! Then ask yourself, "why are we entrusting the fixing of this entire catastrophe to them?" BP is ‘doing everything it can’ (so it tells us) to stem the humongous geyser of oil, gushing from the severed pipe, beneath what once was the Deepwater Horizon Oil Rig in the Gulf of Mexico. 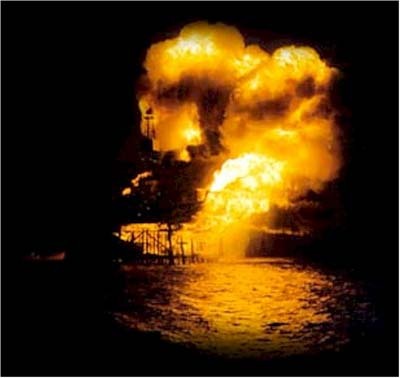 The rig exploded and sank, on April 20, 2010 killing 11 workers and injuring 17 others. a minor correction: rand paul is a senate candidate in ky, not in tn. Al;l excellent points. so where is the movement here? what are the concrete demands that connect with people's outrage? This is an opportunity and let's not let it flow through hands like water (oil?)! !